Bermudian swimmer Lisa Blackburn recently competed in the Canadian Masters National Championships held in Ottawa, where she was in fine form – winning 6 different races all in record setting style. 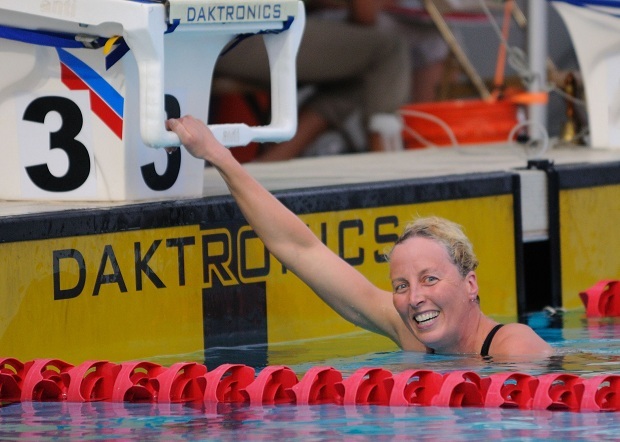 She finished 1st – and set new Canadian Masters records – in the 100m breast stroke, 50m breast stroke, 100m individual medley, and 200m breast stroke. Ms Blackburn also finished first in the 50m butterfly and 50m freestyle, both times setting new Ontario records. Speaking after the competition she said, “It was great to go back to Ottawa for the Canadian Masters Nationals. Representing the Nepean Masters Swim Club and catching up with old friends and coaches was also blast. “Breaking the records was an added bonus but the most enjoyable part of the weekend was going home to the city where I grew up, swimming with my old teammates and enjoying the process of swimming and racing again. She thanked her coach Paul Yetter, the staff at Sandys 360, Colonial Insurance and the Bermuda Olympic Association for their continued support. Brilliant performances by Ms Blackburn who shows that age is not a barrier to achieving your goals. You go girl! Great going Lisa. I know your mum and dad are still very proud of your accomplishments. Your enthusiasm for your sport shows no bounds. Just wish more Bermudian athletes like yourself showed the same determination and dedication to compete on the International stage. Congrats are in order – @ Lackey ..there are loads of Bermudian athletes doing well and many in far more challenging environments no disrespect but it is the Canadian Masters no…. Congratulations Lisa, you have what it takes to keep going. Wishing you all the very best as you continue with your passion. Well done Lisa. Keep up the excellent work. Go Get’em Tiger. This lady and others like her need to be celebrated! So many Bermudians doing great things around the world that we should hear more about.